Tanna of the third generation, living in the period between the destruction of the Temple and the fall of Bethar. He was of priestly lineage, and he expressly states that he officiated in the Temple with the priests (Yer. Yoma iii. 7); in the pride of his rank he used to demand the heave-offering even after the Temple had fallen (Tosef., Ḥag. iii., end). His devotion to his mother was such that he used to place his hands beneath her feet when she was obliged to cross the courtyard barefoot (Ḳid. 61b), while his generosity made him return to the father the redemption-money for the first-born, although it was his priestly perquisite (Tosef., Bek. vi. 14). Once, in a time of famine, he took 800 wives so that they might, as wives of a priest, exercise the right of sharing in the tithes (Tosef., Ket. v. 1). On one occasion, when from his window he saw a bridal procession evidently of the poorer classes, he requested his mother and sister to anoint the bride that the groom might find more joy in her (Ab. R. N. xli., end). Although he was blessed with riches, he possessed extraordinary modesty; in one instance he deeply regretted having mentioned his name in a time of peril, since he feared that in using his position as teacher to escape from danger he had seemingly violated the rule against utilizing knowledge of the Torah for practical ends (Ned. 62b). Although as a halakist R. Ṭarfon was an adherent of the school of Shammai, only two passages describe him as following its teachings (Yeb. 15b; Yer. Sheb. iv. 20), and he always inclined toward leniency in the interpretation of those halakot of Shammai which had not actually been put into practise (Kil. v. 6; Yeb. xv. 6; Ket. v. 2); often he decided in direct opposition to the Bet Shammai when it imposed restrictions of excessive severity (Yeb. xv. 47; Naz. v. 5). R. Ṭarfon was also the author of independent halakot, one being on the form of benediction when quenching thirst with water (Ber. vi. 8), and another on the benediction for the eve of the Passover (Pes. x. 6). The majority of his rulings, however, deal with subjects discussed in the orders Nashim, Ḳodashim, Ṭohorot, and NeziḲin. In those found in Ṭohorot his tendency is always toward severity, while in Neziḳin are found his sayings on lost objects and usufruct (B. M. iv. 3, v. 7), the payment of debts, the money due a woman when she receives a bill of divorce (Ket. ix. 2, 3), and damage caused by cattle (B. K. ii. 5, and the baraitot connected with this passage, p-26). If he had belonged to the Sanhedrin, the death-penalty would have been abolished (Mak. i. 10; comp. Frankel, "Der Gerichtliche Beweis," p. 48, Berlin, 1846). R. Ṭarfon engaged in halakic controversies with R. Akiba (Ket. 84a; Pes. 117, 118), but the two agreed with regard to a tosefta (Miḳ. i.; Ḳid. 66; Yer. Yoma. i. 1; Ter. iv. 5; Mak. i. 10; Ker. v. 3), with R. Simeon (Men. xii. 5; possibly, however, an error for R. Akiba), and R. Eleazar ben Azariah (Yad. iv. 3). Other sayings of his have been preserved which were accepted without controversy (Pes. 117a, 118a; Giṭ. 83a); and two of his apothegms are especially noteworthy as indicating his intense earnestness: "The day is short, the labor vast, the toilers idle, the reward great, and the Master urgent" (Ab. i. 15); "It is not thy task to complete the work, neither art thou a free man that thou canst withdraw thyself; if thou hast learned much, great shall be thy reward, for He that doth hire thee will surely repay thee for thy toil; yet the requital of the pious is in the future" (Ab. i. 17). In the discussion as to the relative importance of theory and practise, Ṭarfon decided in favor of the latter. When Eliezer ben Hyrcanus was sick, and a deputation was sent to him, R. Ṭarfon acted as the spokesman, addressing him as follows: "Master, thou art of more worth to Israel than the sun, for that gives light only on earth, while thou dost shed thy rays both in this world and in the world to come" (Sanh. 101a; Mek., Baḥodesh, xi. [ed. Weiss, p. 80a]). In like manner heled a number of scholars in a visit to R. Ishmael ben Elisha, upon the death of the sons of the latter (M. Ḳ. 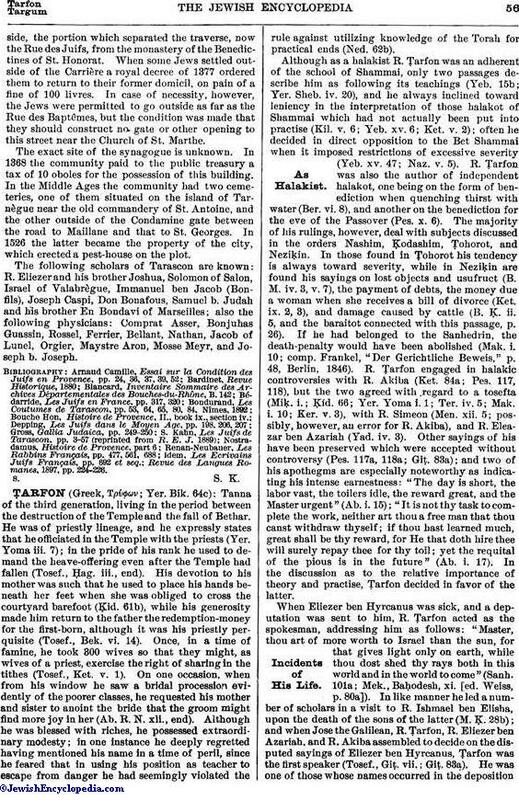 28b); and when Jose the Galilean, R. Ṭarfon, R. Eliezer ben Azariah, and R. Akiba assembled to decide on the disputed sayings of Eliezer ben Hyrcanus, Ṭarfon was the first speaker (Tosef., Giṭ. vii. ; Giṭ. 83a). He was one of those whose names occurred in the depositionof Gamaliel II., and it is expressly stated that he was addressed as "brother" by the other scholars. He is said to have dwelt at Jabneh, although it is evident that he lived also in Lydda (Ta'an. iii. 9; B. M. iv. 3; Ḥag. 18a). 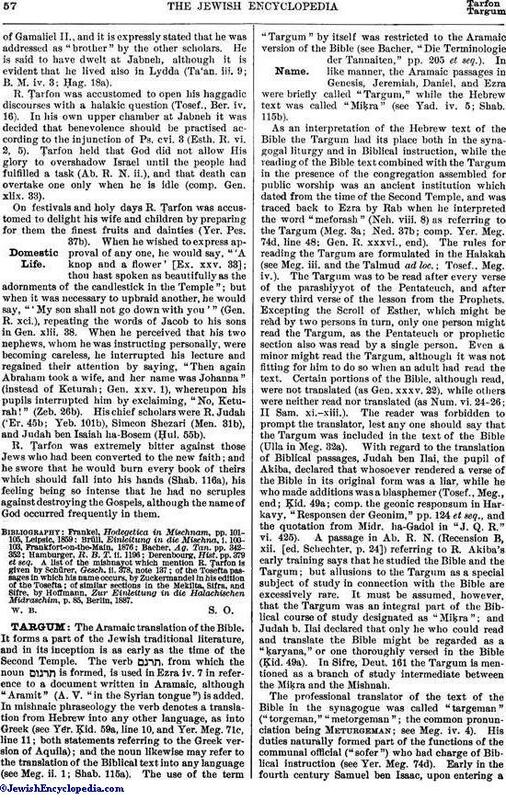 R. Ṭarfon was accustomed to open his haggadic discourses with a halakic question (Tosef., Ber. iv. 16). In his own upper chamber at Jabneh it was decided that benevolence should be practised according to the injunction of Ps. cvi. 3 (Esth. R. vi. 2, 5). ṬTarfon held that God did not allow His glory to overshadow Israel until the people had fulfilled a task (Ab. R. N. ii. ), and that death can overtake one only when he is idle (comp. Gen. xlix. 33). On festivals and holy days R. Ṭarfon was accustomed to delight his wife and children by preparing for them the finest fruits and dainties (Yer. Pes. 37b). When he wished to express approval of any one, he would say, "'A knop and a flower' [Ex. xxv. 33]; thou hast spoken as beautifully as the adornments of the candlestick in the Temple"; but when it was necessary to upbraid another, he would say, "'My son shall not go down with you'" (Gen. R. xci. ), repeating the words of Jacob to his sons in Gen. xlii. 38. When he perceived that his two nephews, whom he was instructing personally, were becoming careless, he interrupted his lecture and regained their attention by saving, "Then again Abraham took a wife, and her name was Johanna" (instead of Keturah; Gen. xxv. 1), whereupon his pupils interrupted him by exclaiming, "No, Keturah!" (Zeb. 26b). His chief scholars were R. Judah ('Er. 45b; Yeb. 101b), Simeon Shezari (Men. 31b), and Judah ben Isaiah ha-Bosem (Ḥul. 55b). R. Ṭarfon was extremely bitter against those Jews who had been converted to the new faith; and he swore that he would burn every book of theirs which should fall into his hands (Shab. 116a), his feeling being so intense that he had no scruples against destroying the Gospels, although the name of God occurred frequently in them. Derenbourg, Hist. pp. 379 et seq. of similar sections in the Mekilta, Sifra, and Sifre, by Hoffmann, Zur Einleitung in die Halachischen Midraschim, p. 85, Berlin, 1887.